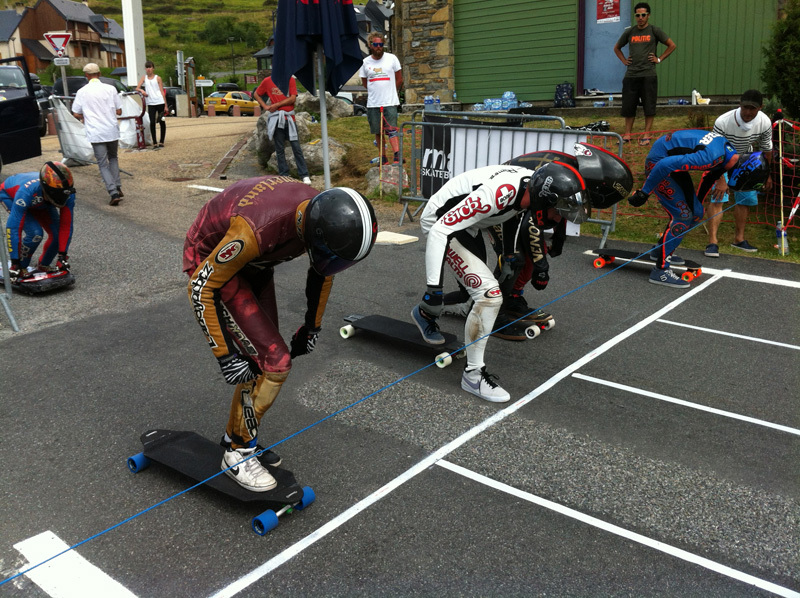 Day 3 at Peyragudes was scheduled for repechage, in this case bracket B and in the afternoon the French Championships. Bracket B was seeded through the timed qualification, which was done the day before. Riders who qualified 61 and up had to start and we're riding for those last 4 spots in bracket A. The day started around 10 with a dry track, which is always important for the safety of riders, especially on a track like this. The first heats started and the bracket went smoothly without any big delays. Riders raced each other until there were only 4 left. These 4 were; Rasmus Klintrot, Radek Lucas, Zac Italiano and Jorund Bratset. 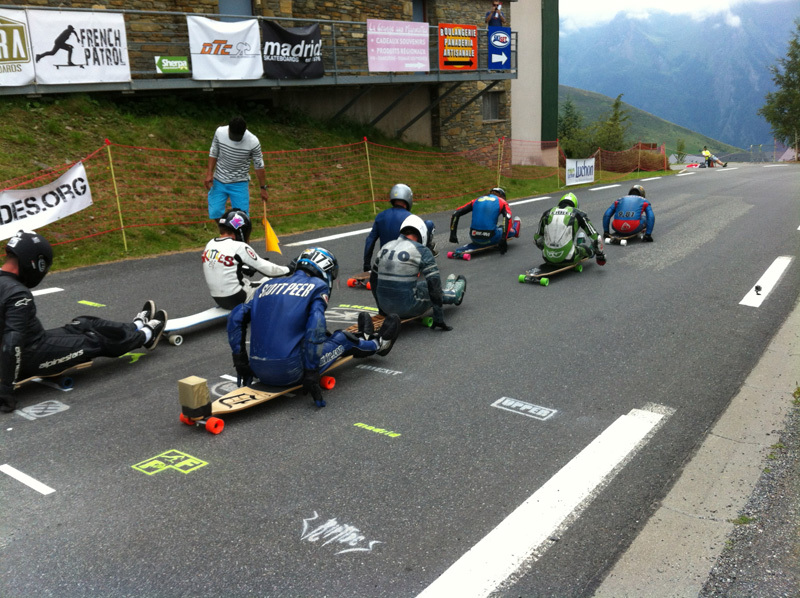 After lunch the French riders were up to race open, women, juniors, classic and street luge for the French championship (non-IDF). The number of riders is not very high, so we shot through the heats and the day ended quite early and some freerides were offered to those who wanted (and had wheels to spare). Then day 4 came, the final day. Luckily the weather was still on our side, it was dry and sunny. Nice conditions for a downhill race in the mountains. 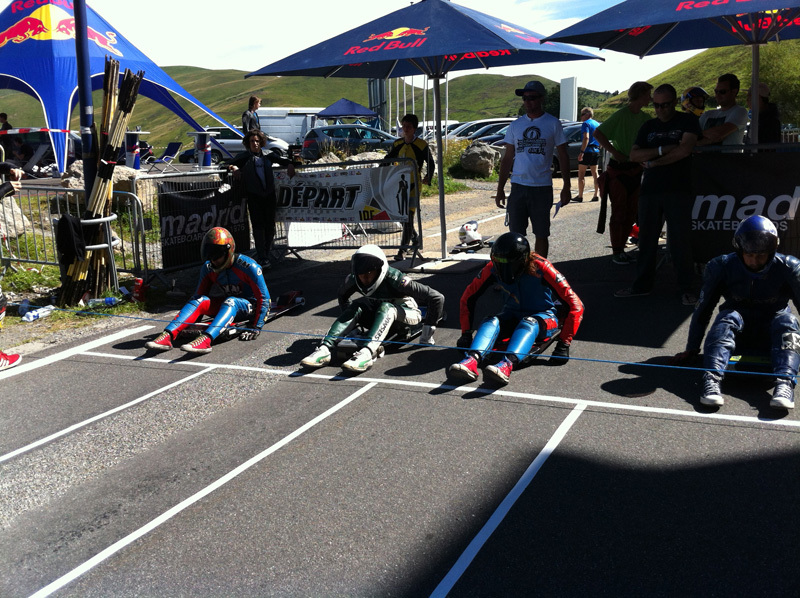 The program of the morning featured street luge and juniors, starting with street, running a 16-man bracket. This means there was one elimination round from which 8 riders would emerge, who were in the semi finals, which was ran to allocate the position for the finals. It was no surprise the incredible fast Mikel Echegaray-Diez won this, although he was closely followed by Abdil Mahdzan, who had the challenge to beat at least 1 Spaniard, so it wouldn't be an all Spanish podium, in which he succeeded, beating Jan Tarradas and Ander Lopez, who won the French Championship the day before (although being Spanish, but is holding a French federation license). With Juniors there were 15 riders waiting to beat the unstoppable Aussie Connor Ferguson, but this is an almost impossible task, so it was more a battle for 2nd and 3rd, which was taken by Zac Italiano (also from Australia) and Patrick Lombardi (Italy). After lunch it was time to start the A bracket, with 64 riders and joined by classic luge and women after 2 rounds. Classic was a bit different this year, it was done Grand Prix format. So instead a 4 man heat, all classic lugers were lined up on the start line, like in Formula 1, based on their qualification time. 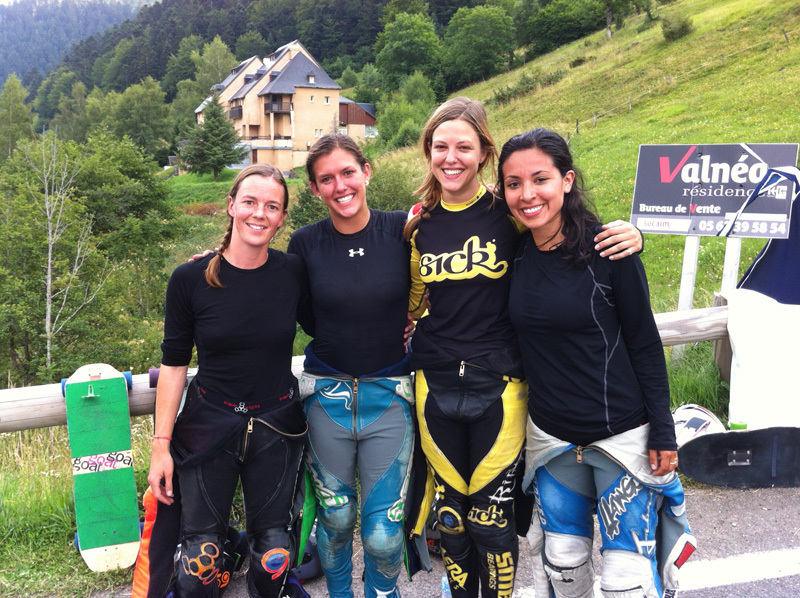 In the women's final the expectation was Elena Corrigall would take the win, but she crashed so Marie Bougourd and Maga McWhinnie were able to overtake her and take places 1 and 2. Elena now came in third, before Tamara Prader. The skill level is rising as we said before. Here there were 7 juniors who made it into the A bracket. 5 by qualifying and 2 through advancing from the B bracket. After the first round, 3 of them were still in; Connor Ferguson, Philip Schickor and Johannes Aalholm. Connor and Johannes were out after round 2 and Philipp got knocked after the third one. When the semis approached the tension was on, here was decided who would make it into the finals and get a shot at the PND cup 2014. In semi final A Kevin Reimer and Zak Maytum beat Aaron Hampshire and Byron Essert and in semi final B Patrick Switzer and Dillon Stephens beat Jimmy Riha and Kyle Wester. So the final was set: Kevin, Zak, Patrick and Dillon. The push of came after some delay since the octocopter cam wasn't ready and we all want that nice aerial footage 😉 Mikel followed closely on his street luge for some follow cam footage. Kevin pushed out front and basically stayed there. Zak was in second, but Patrick passed by him after the long left corner. See some footage here. So the final score was: Kevin, Patrick, Zak, Dillon. And with this final race, the Euro tour had come to an end. Patrick Switzer takes the lead in the rankings with Kevin following closely. 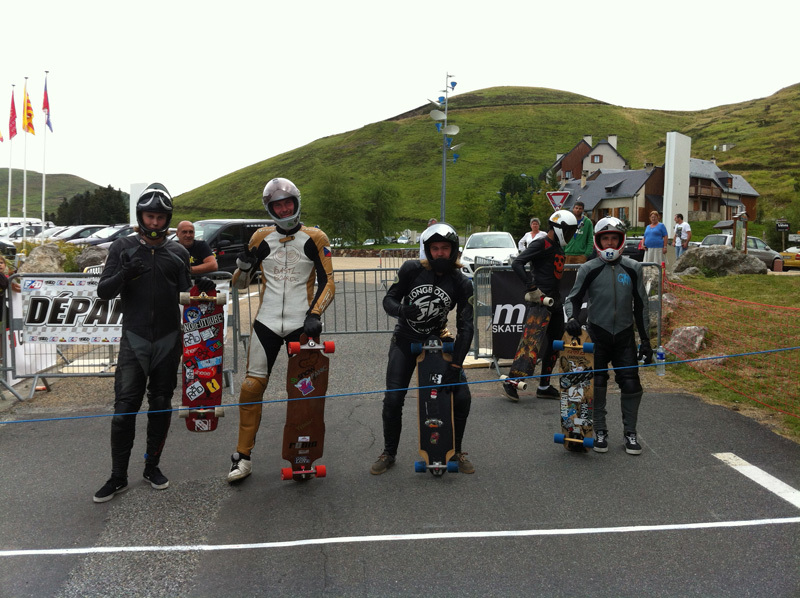 It will be tight at Angie's Curves and Pikes Peak but first there's the WQS race ACME Extreme Downhill. A last note is for Koma Kino. This Peyragudes Never Dies was his last one as organizer of the event. He will be stepping down to spend more time with his family and on the IDF. Thank you for all your work.